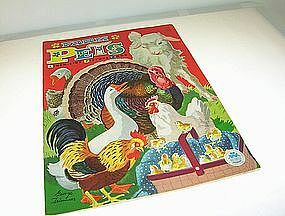 A delightful children's Farm Pets Linen-like picture book in excellent condition is available for purchase. This book is being SOLD AS IS/WHERE FOUND CONDITION. It originally sold for 15 cents I do not see a date on this particular book except copyright USA Merrill Company Publishers, fine books for children Chicago 11. So it had to have been published before Zip codes in the 60s. The ilustrations are just super in this book. Please email me for any questions you may have. I will be happy to reply. Will mail this book to USA address for $5.00. Will accept money orders and cashier checks. Will also accept personal checks with UP to 10 days to clear. THANKS.